Married Name circa 1911 As of circa 1911,her married name was Peterson. Louise A. Stewart was born circa 1886 at Wisconsin. She married Hans P. Peterson circa 1911. Milton Laverne Peterson was born on 19 September 1912 at Wisconsin. He was the son of Hans P. Peterson and Louise A. Stewart. Milton Laverne Peterson died on 29 May 1961 at age 48. Evelyn Berniece Peterson was born circa 1915 at Wisconsin. Evelyn Berniece Peterson died in 1985. Married Name Her married name was Jank. Maureta Janice Peterson married Joseph John Jank Jr.
Maureta Janice Peterson was born on 23 December 1916 at Wisconsin. Maureta Janice Peterson died on 3 March 1993 at age 76. Joseph John Jank Jr. married Maureta Janice Peterson, daughter of Hans P. Peterson and Louise A. Stewart. Joseph John Jank Jr. was born on 26 August 1916 at Wisconsin. He died on 20 September 1993 at Wisconsin at age 77. Joseph J. Kane was born circa 1918 at South Dakota. He was the son of William Francis Kane and Katherine Marie Bechen. Joseph J. Kane died after 1976. [S373] U.S. Federal Census 1940 U.S. Federal Census, by Ancestry.com, Year: 1940; Census Place: Forbes, Charles Mix, South Dakota; Roll: T627_3851; Page: 2A; Enumeration District: 12-7. Married Name Her married name was Thomson. Married Name after 1976 As of after 1976,her married name was Kopplin. Katherine Frances Kane married Harold Leland Thomson. Katherine Frances Kane was born on 28 January 1922 at South Dakota. She was the daughter of William Francis Kane and Katherine Marie Bechen. Katherine Frances Kane married (?) Kopplin after 1976. Katherine Frances Kane died on 3 March 2010 at Illinois at age 88. Alfred Thomas Kane was born on 6 July 1924 at Platte, South Dakota. Alfred Thomas Kane died in April 1975 at age 50. Married Name 19 April 1949 As of 19 April 1949,her married name was Fuhrman. Marie Rose Kane was born on 23 January 1927 at Platte, Charles Mix, South Dakota. Marie Rose Kane married Victor Fuhrman on 19 April 1949 at Charles Mix, South Dakota. Marie Rose Kane died on 27 May 2007 at age 80. Leroy B. Kane was born circa 1931 at South Dakota. Name Variation Helen B. Ratzman was also known as Helen E.
Married Name 17 September 1934 As of 17 September 1934,her married name was Bechen. Helen B. Ratzman was born circa 1905 at South Dakota. 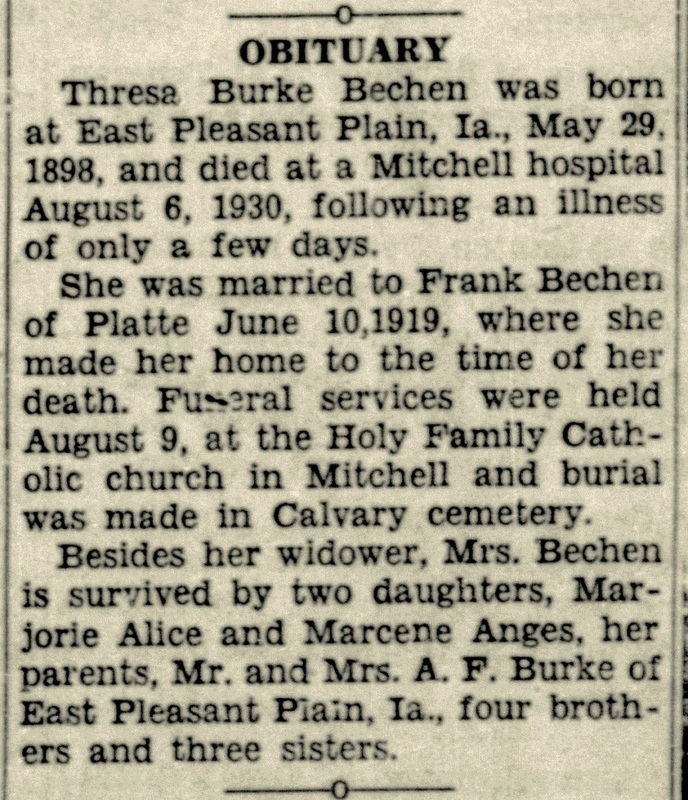 She married Francis Patrick Bechen, son of Nicholas Bechen and Nellie F. O'Rourke, on 17 September 1934 at Brule, South Dakota. [S373] U.S. Federal Census 1940 U.S. Federal Census, by Ancestry.com, Year: 1940; Census Place: Darlington, Charles Mix, South Dakota; Roll: T627_3851; Page: 2B; Enumeration District: 12-6. Name Variation Thresa Burke was also known as Theresa. Name Variation Thresa Burke was also known as Tresa. Married Name 10 June 1919 As of 10 June 1919,her married name was Bechen. Thresa Burke was born on 29 May 1898 at Iowa. She married Francis Patrick Bechen, son of Nicholas Bechen and Nellie F. O'Rourke, on 10 June 1919. 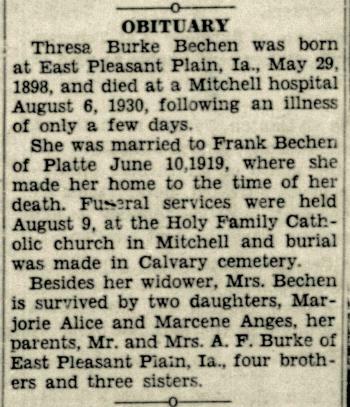 Thresa Burke died on 6 August 1930 at Mitchell, South Dakota, at age 32 Thresa Burke Bechen obituary. Married Name Her married name was Fliss. Marilyn Alice Mader married Marvin L. Fliss. Marilyn Alice Mader was born on 1 October 1934 at South Dakota. She was the daughter of Philip J. Mader and Velzora A. Deremore. Marilyn Alice Mader died on 16 July 2010 at Nevada at age 75. Marvin L. Fliss married Marilyn Alice Mader, daughter of Philip J. Mader and Velzora A. Deremore. Marvin L. Fliss was born on 1 December 1932 at Iowa. He died on 27 February 2007 at Nevada at age 74. Jerome Merlin Sylliaasen was born on 17 February 1937 at South Dakota. He was the son of Henry Sanford Sylliaasen and Viola Josephine Braunesreither. Jerome Merlin Sylliaasen died on 23 April 2011 at South Dakota at age 74 Jerome M. Sylliaasen, age 75 of Mission Hill, SD passed away Monday, April 23, 2011 at Avera Sacred Heart Hospital, Yankton, SD. Funeral services will be 2:00 p.m. Monday, April 30, 2012 at Vangen Lutheran Church, Mission Hill, SD with Rev. Lance Lindgren officiating. Burial will be in the Vangen Lutheran Cemetery with Military Graveside Rights by the Rudolph Christensen American Legion Post #237. Visitations will begin at 5 p.m. Sunday, April 29, 2012, at the Opsahl-Kostel Funeral Home & Crematory, Yankton, SD, with a Scripture service at 7:00 p.m. Visitations will resume one hour prior to the service at the church. Pallbearers will be Scott Simonsen, Timothy Simonsen, Jessica Epp, Tyler Larsen, Nathan and Briana Epp, and Alexa Larsen. Honorary pallbearers are Robert Oien, Marvin Ekeren, Charles Cowman, Darrell Ekeren, Bernal Huber, Ralph Guenther and Ken Kjer. Jerome M. Sylliaasen was born on February 17, 1937 at Sacred Heart Hospital, Yankton, SD to Henry and Viola (Braunesreither) Sylliaasen. He attended grade school at Pleasant Valley, Inch, and Mission Hill, and attended high school at Gayville, graduating in 1956. He worked on a farm owned by Howard Magorien all through High School. After graduation, he enlisted in the Army in September 1956 and served for two years. He was discharged in September, 1958. He married Dorothy Ann Remington at St. Johns Lutheran Church on September 28, 1958. To this union, two children were born, Pamela and Patricia. He worked for Freeman & Company, AB Vinateri Plumbing and Yankton County Highway Department. In 1962 the family moved to California where he worked for Hytone Paper Company, Garden Grove, CA and Kimberly Clark, Fullerton, CA. In 1964, the family returned to South Dakota to farm with his father and brother, Alan, in Mission Hill. Jerome continued farming until he retired in 2008. Jerome was a 4-H Leader for many years, a member of the Moose Lodge, Elks Lodge and American Legion. He was baptized, confirmed and a lifetime member of Vangen Lutheran Church of Mission Hill and served as Usher, Deacon and was Secretary on the cemetery board for 30 years. He is survived by his wife, Dorothy of Mission Hill, SD; two daughters, Pamela (Raymon) of Mission Hill, SD, Patricia Larsen of Yankton, SD; grandchildren, Jessica Epp of Pollock, LA, Nathan (Briana) Epp of Yankton, SD, Tyler Larsen of Yankton, SD, Alexa Larsen of Yankton, SD; sister, Diane (Jim) Johnson of Ormond Beach, FL; brothers and sisters-in-law, Dolores Christensen of W. Garden Grove, CA, Robert Remington of Hemet, CA, Ken (Lonnie) Remington of Yankton, SD, Donald Remington of Hemet, CA, Wilma (Roger) Simonsen of Menno, SD, Mary (Michael) Cline of Lake Havasu, AZ; and uncle, Wayne Lane of Phoenix, AZ; several nieces, nephews and cousins. He was preceded in death by his parents, Henry in 1981 and Viola Sylliaasen in 1996 and two brothers, Gale Sylliaasen in 1960 and Alan in 2003; son-in-law, Verlin Larsen on November 17, 2011. Verlin Larsen was born on 7 December 1963. He was the son of Richard Larsen. Verlin Larsen died on 17 November 2011 at age 47. Gale Lee Sylliaasen was born on 21 February 1939 at South Dakota. Gale Lee Sylliaasen died on 7 May 1960 at age 21. Alan Dean Sylliaasen was born on 14 March 1952 at South Dakota. Alan Dean Sylliaasen died in 2003. Richard Larsen died before November 2011. (?) Remington married (?) Morgan. Married Name Her married name was (?) Remington. (?) Morgan married (?) Remington. Name Variation Christian Bechtold was also known as Becktold. Christian Bechtold married Caroline (?). Christian Bechtold was born circa 1874 at Russia. He died after April 1940. [S373] U.S. Federal Census 1940 U.S. Federal Census, by Ancestry.com, Year: 1940; Census Place: Tyndall, Bon Homme, South Dakota; Roll: T627_3848; Page: 8B; Enumeration District: 5-20. Married Name Her married name was Becktold. Married Name Her married name was Bechtold. Caroline (?) married Christian Bechtold. Caroline (?) was born circa 1888 at Russia. She died after April 1940. Name Variation Austin Leroy Doyle was also known as Auston. Austin Leroy Doyle was born on 2 November 1904 at Lafayette, Wisconsin. He was the son of John Doyle and Amanda B. Wahler. Austin Leroy Doyle married Mary Burgess on 1 November 1930. Married Name 1 November 1930 As of 1 November 1930,her married name was Doyle. Mary Burgess was born circa 1905 at Wisconsin. She married Austin Leroy Doyle, son of John Doyle and Amanda B. Wahler, on 1 November 1930. Married Name 20 June 1959 As of 20 June 1959,her married name was Walter. Joyce Marie Doyle was born on 18 September 1934 at Wisconsin. She was the daughter of Austin Leroy Doyle and Mary Burgess. Joyce Marie Doyle married Richard H. Walter on 20 June 1959. Joyce Marie Doyle died on 25 October 2010 at Wisconsin at age 76 Joyce M. Walter, age 76 of Platteville, WI, formerly of Shullsburg, WI, passed away Monday, October 25, 2010, at Southwest Health Center in Platteville. She was born September 18, 1934 in Lafayette County, WI, the daughter of Auston and Mary (Burgess) Doyle. Joyce graduated from Shullsburg High School in 1953. She was united in marriage to Richard H. Walter on June 20, 1959 at Centenary United Methodist Church in Shullsburg. Joyce lived in Shullsburg all of her life where she worked as a waitress and cook at The Roost at the corner of Highways 11 and 23 near Shullsburg until 1994. Joyce is survived by three children: Linda Heim of Prairie du Chien, WI, Douglas (Penny) Walter of Darlington, WI, and Kathy (Glen) Goeschel of Dubuque, IA; seven grandchildren; and four sisters: Rose Mary (Walt) Howald of Forreston, IL, Lois Symons of Janesville, WI, Nancy (Pete) Lunde of Necedah, WI, and Elizabeth Louise (Edward) Friede of Waukesha, WI. She was preceded in death by her husband: Richard on July 21, 2004; and one son: Daniel Walter in 1991. Joyce was a member of Centenary United Methodist Church in Shullsburg and its United Methodist Women. She enjoyed collecting elephant paraphernalia, crocheting, and going to the Dog Track. Funeral service will be held Saturday, October 30, 2010, at 11:00 A.M. at Centenary United Methodist Church, 226 West Church Street in Shullsburg with Rev. Brenda Whitford officiating. Burial will be in Evergreen Cemetery in Shullsburg. A visitation will be held Friday, October 29, 2010 from 4:00 P.M. until 8:00 P.M. at OFlahrity-Erickson Funeral Home in Shullsburg. Richard H. Walter married Joyce Marie Doyle, daughter of Austin Leroy Doyle and Mary Burgess, on 20 June 1959. Richard H. Walter died on 21 July 2004. Daniel Walter was the son of Richard H. Walter and Joyce Marie Doyle. Daniel Walter died in 1991. John Doyle married Amanda B. Wahler. Name Variation Amanda B. Wahler was also known as Manda. Amanda B. Wahler married John Doyle.